My niece, Shelby, is a major superstar cheerleader. She cheers with a squad that competes beyond the local and state levels to the national and world levels. On top of that, she has a great attitude about it all and is not stuck on herself. She also happens to be brilliant and has a terrific life-plan laid out as a freshman in high school. So cheering isn’t the only thing she good at, but still she is a fantastic cheerleader… maybe the best on her squad. PR31 (aka, my sweet wife, Angela) is my biggest cheerleader. She is always right there with me, believing in me… challenging me… encouraging me… stirring my hope and faith… doing whatever it takes to keep me going toward my goals. If I’ve just mowed, weed-eated & cleaned up the yard, she tells me how great it looks. If I’m just about to preach a message to a crowd in a setting I’m nervous about, she tells me that I’ve got it and will hit it out of the park. If I actually put my dishes in the dishwasher… well, I don’t guess I deserve a pat on the back for that. 😜 But she does take note of it & commends me anyway. We all need someone in our life who is our biggest cheerleader. We need an encourager who believes in us beyond everyone else… and even when no one else believes in us. In Scripture… the book of Acts to be exact… Saul (who would become later known as the Apostle Paul, evangelize multiple countries and write at least half of the New Testament) had just converted to Christianity but no one believed him because he had most recently been having Christians imprisoned and killed. He needed a cheerleader. And so God gave Saul a guy named Barnabas. His name means, “Son of Encouragement.” Wow! Who wouldn’t want that guy in your corner?! Whatever he said or did must have worked because the Christians soon accepted Saul and even began to support him in his missionary endeavors. Have One or Be One? We all want someone like Shelby or Angela or Barnabas in our lives. We want someone to be our biggest cheerleader. 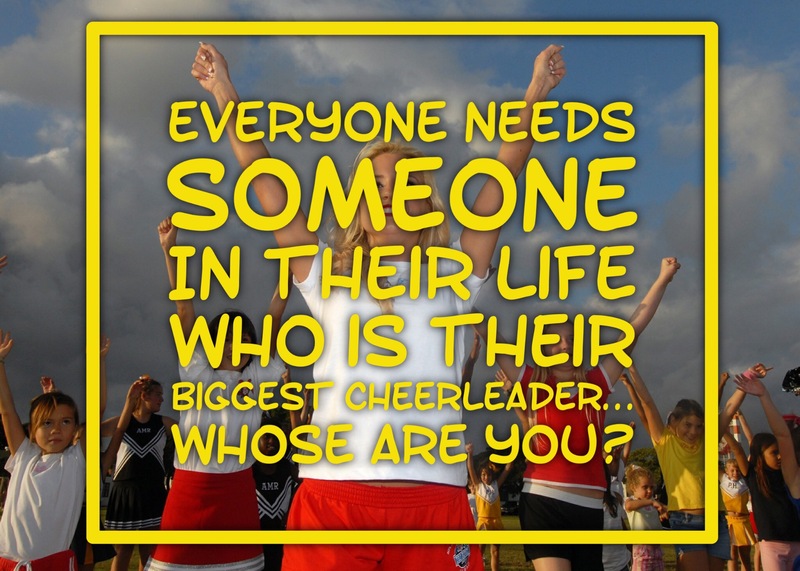 But I leave you with this question today… Who could say right now that you are their biggest cheerleader? Not sure? Then why don’t you take time right now to pick one person and determine to cheer them on ridiculously? I mean, go over the top. Embarrass them with your cheering. Make sure no one else who cheers them on in life even comes close. Then watch as that person begins to become all they dream of becoming and accomplishes all they dream of accomplishing.